Girl Kuripot Girl Kuripot: @ElectroluxPH #DiscoverE Food Festival This Weekend! @ElectroluxPH #DiscoverE Food Festival This Weekend! 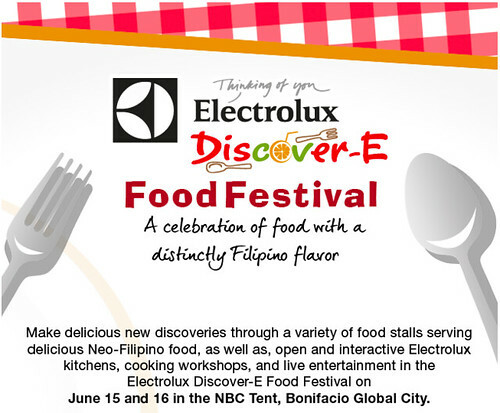 The Electrolux Discover-E Food Festival is happening this weekend at the NBC Tent! It's a 2-day event filled with food stalls, cooking workshops and live entertainment - June 15 to June 16, 2013 at the Bonifacio Global City. Electrolux Philippines took us on a full-day journey to Pampanga a few weeks ago to discover Neo-Filipino food. Here are a few sample "Discover-E"s I had! Pampanga Food Tour, My Discover-E Trip with Electrolux Philippines! First Stop - Breakfast Feast at Atching Lillian Borromeo's in Mexico! Pampanga Food Trip, San Nicholas Cookie Making at Atching Lillian's! Kabigting's Unique Halo-Halo, a Very Special Food Trip in Pampanga! You can also join the Instant Discover-E Photo Contest for a chance to win Discover-E Festival passes and other prizes! Click here for more info on the Electrolux Philippines Discover-E Food Festival.